Mumbai, 31st May, 2017: Rohto Pharmaceutical Co., Ltd. (“Rohto”) Japan, today, announced a Capital and Business Alliance with SastaSundar Healthbuddy Limited, a wholly owned subsidiary of SastaSundar Ventures Limited, an NSE and BSE listed company, owning and operating SastaSundar.com, a leading digital network of healthcare in India. Rohto has invested $5 million (Rs 32.2 crores) in SastaSundar Healthbuddy Limited and is likely to make further investments as the business progresses. 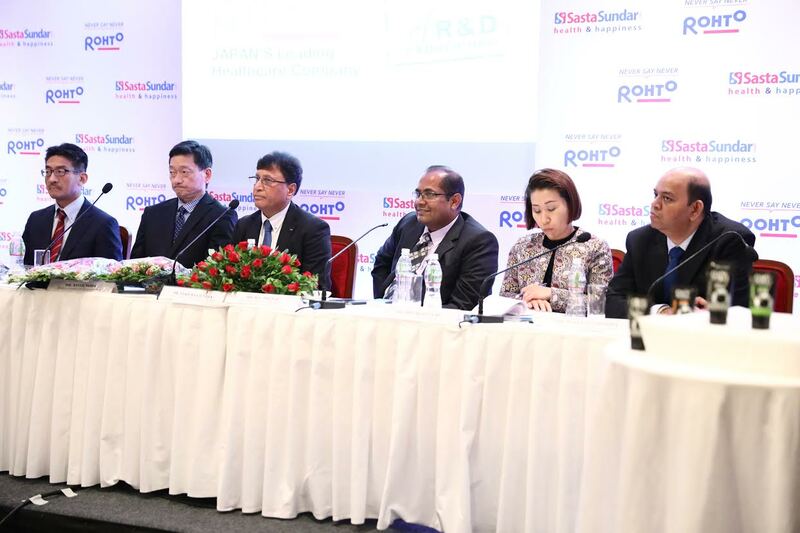 Dr. Lekh Raj Juneja, Executive Vice-President & Global Head International Business of Rohto, Mr. B. L. Mittal, Founder & Executive Chairman, SastaSundar Healthbuddy Limited, His Excellency, Mr. Ryoji Noda (Consul General of Japan in Mumbai), Mr. Koji Suzuki, Managing Director, Rohto Pharma (India) Pvt Ltd. & Mr. Ravi Kant Sharma, Managing Director & CEO, SastaSundar Healthbuddy Limited were present to announce this grand alliance. Established in 1899, Rohto initially played a role in every customer’s welfare with its drugs including unique eye drops and gastrointestinal medicines. Later, the company successfully ventured into dermal medicines, skin care, and functional foods. Rohto, a global leader, selling and marketing its products in more than 120 countries, aspires to become a company that challenges itself for “healthy life span” through both advanced life science and daily lifestyle based on technological expertise. Rohto entered India in 2010, by establishing its wholly-owned subsidiary ‘Rohto Pharma (India) Pvt. Ltd.’, with its leading lip care brand ‘LipIce’. The following year it launched a range of products including ‘LipIce Color’ under its brand ‘LipIce’. Subsequently, it launched two new brands – ‘OXY’ specialised skin care range for men, and ‘Acnes’ for specialised acne care, in India. SastaSundar.com is building India’s leading digital network of healthcare, managing efficient pharma & wellness products’ supply chain & connecting doctors, diagnostic services, healthcare clinics and health information services. Currently, SastaSundar.com is operating in West Bengal only and will expand to pan India. The digital network of SastaSundar.com is being built upon the online to offline model of healthcare delivery leveraging technology and inventory less service centre of the franchise called Healthbuddy. For the year ended March 2017, the GMV of SastaSundar.com was Rs.153 crores and it delivered close to 17 lacs orders. As on date, it has 178 Healthbuddy stores with 4.40 lacs registered customers. SastaSundar.com has portfolio of its own brand which includes unique line of customised health supplement called DNAVITA, authentic herbal products in the brand of Healthbuddy and toxin free beauty care - Zerotox. Apart from this product line, it has health information services through its channel “Know Health” which consists of Health Articles, Medicine Info and Substitute of Generic Medicines, Symptoms Checker and Health Tools. SastaSundar.com provides customised app using artificial intelligence and has unique service capability based upon health condition data. “Rohto is looking for the expansion of its base in India with SastaSundar.com as its preferred partner in the e-commerce business. SastaSundar.com has shown significant growth in a short span since starting their operations and we were indeed impressed with their business model and hence decided to invest. Rohto will assist SastaSundar.com in scaling its operations pan-India with our global expertise. Rohto embraces this entrepreneurial opportunity as the friendship between the two great nations of India and Japan. With this alliance, we will in our small ways contribute towards attaining the Hon’ble Prime Minister Of India, Mr Narendra Modi’s vision of Make-in-India and Digital India initiative”, said Dr Lekh Raj Juneja, Exective Vice-President & Global Head International Business of Rohto. “At SastaSundar.com, we use knowledge and digital connectivity to reduce cost and add convenience in making available high quality medicines, healthcare products and services through fast online access and convenient home delivery process to make life simple and happy. We are extremely proud to have Rohto joining hands with us, which will be mutually beneficial. As we are on a growth path and looking for a pan-India expansion, we plan to scale up our operations in Mumbai soon. Our association with Rohto will help us in achieving our immediate goal”, said Mr BL Mittal, Founder & Executive Chairman, SastaSundar Healthbuddy Limited. SastaSundar aims to have a total of 250 Healthbuddy stores in West Bengal & 50 Healthbuddy stores in Delhi by March 2018. “By utilising the network of SastaSundar we will be introducing well-acclaimed products fromour global brands in the healthcare segment in India. This will also help us in expanding our footprints in India, which is a key emerging market for us”, added Dr Juneja. “Partnership of Rohto and SastaSundar.com will address one of the biggest problem of India - consistent access to affordable healthcare in a convenient manner”, added Mr Mittal. India is one of the largest manufacturers of medicines in the world and boasts of the best of doctors. Yet, the majority of Indians do not have access to consistent and affordable healthcare. This is where the association between Rohto and SastaSundar will play a major role in connecting the missing link by leveraging digital technology.